A plane takes off from Hartsfield-Jackson Atlanta International Airport. As winter starts to wind down, you may be stepping up your plans for a spring-break trip. But have you checked airfares lately? If you haven&apos;t looked since Christmas, you may be in for a surprise: Many fares are up. In fact, the largest U.S. carriers have nudged rates higher three times in recent weeks. 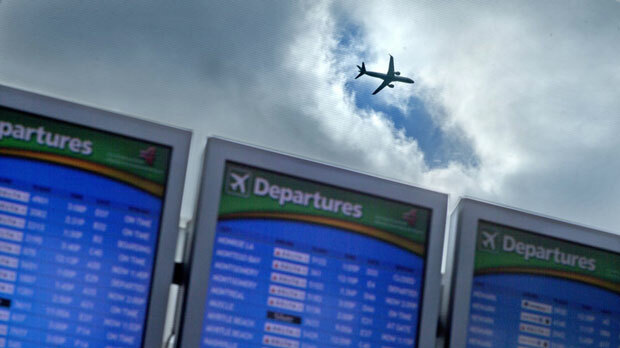 Farecompare.com, a fare tracking website, says airlines are charging $22 more for round-trip flights this year. Most of the hikes are hitting smaller cities and less competitive markets. To you, these fare increases may make no sense. After all, jet fuel prices have plunged to the lowest levels since 2009. And last year, those fuel bargains helped knock down airfares. The U.S. Bureau of Transportation Statistics says the average domestic airfare fell to $372 in the fall of 2015, a 6.2 percent drop from the previous year. The Bureau of Labor Statistics said for all of 2015, international fares fell 15 percent. So back in January, passengers had good reason to believe such trends would continue. After all, Delta said last month that it paid an average of $1.85 per gallon for jet fuel in 2015, a 30 percent plunge from 2014. And for this first quarter of 2016, it said it expected to pay between $1.20 and $1.25 per gallon. And that led many travelers and experts to think they&apos;d see more cheap fares well into 2016. Airlines say they have started hiking fares this year largely because their labor costs are rising. "After decades of workforce reductions, U.S. airlines are adding jobs again — some 10,000 last year — and investing more money into employee benefits and wages," according to Melanie Hinton, a spokeswoman for Airlines for America, an industry trade group. In addition, airlines still need to shake off the impact of the Great Recession, she said. Thanks to the economic recovery, airlines have been able "to collectively pay down more than $50 billion in debt over the past six years and make significant reinvestments," including buying hundreds of new planes, she said. But even if airlines can point to rising wages and new-plane costs to justify higher fares, Kevin Mitchell, who heads the group advocating for business travelers, says there can be no excuse for the continued imposition of fuel surcharge fees. "It&apos;s really quite outrageous," Mitchell said. Earlier this week, his group, the Business Travel Coalition, called on the Department of Transportation to launch an investigation into fuel surcharges. "Oil prices have plummeted some 70 percent since June of 2014 while most U.S. airlines have left their often outsized fuel surcharges in place," BTC said in its letter to DOT. "We believe that the continued, widespread imposition of these substantial, add-on fuel surcharges in the face of plummeting jet fuel prices cannot be justified." BTC calls the imposition of surcharges "an unfair and deceptive act" that violates the law. Hinton says the various steps airlines are taking to boost profits are not unreasonable in an industry that can go through very intense up and down cycles. When demand for travel is strong as it is now, "airlines seek to maximize benefits for multiple stakeholders, including customers, employees and shareholders," she said.